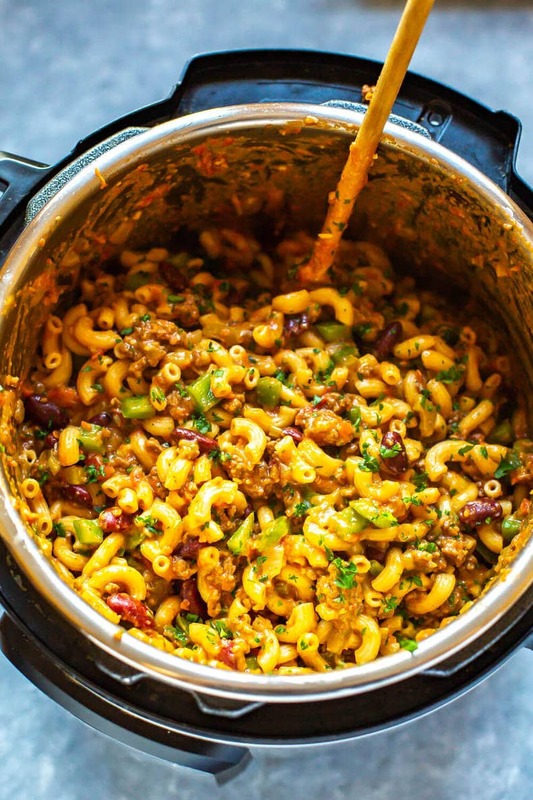 This Instant Pot Chili Mac is pretty much what you've been dreaming of your whole life when it comes to wholesome, hearty comfort food. 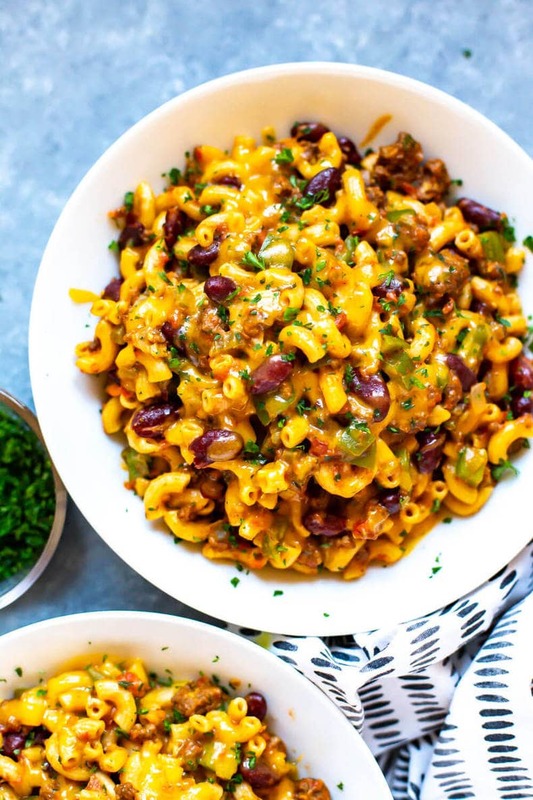 Come on, chili AND mac and cheese all in one? It really is like a dream come true! 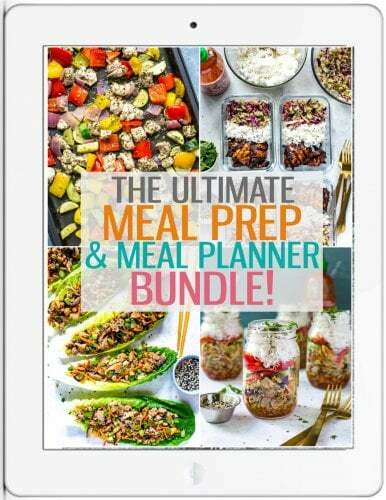 Whether you're gonna make it as a last-minute weeknight dinner or you're meal prepping it for the work week, guaranteed you are going to love all the flavours and you'll definitely also appreciate how quick and easy it is to put together! 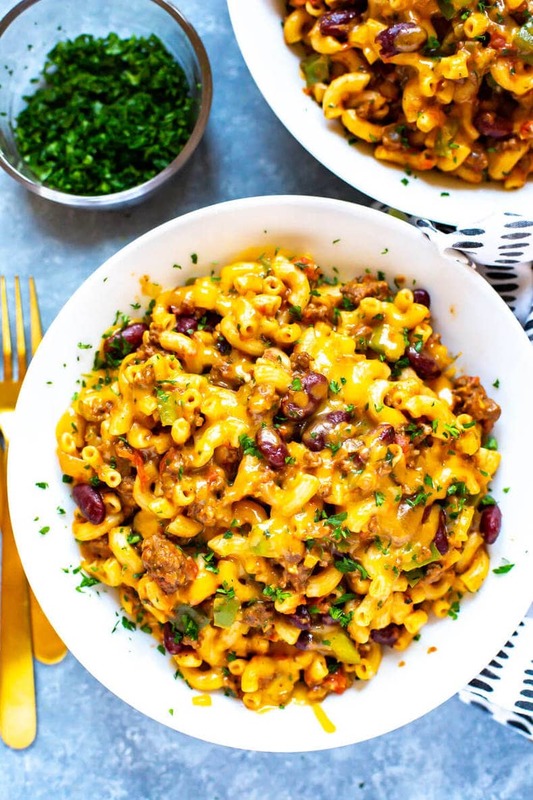 And as if that's not enough, you should know that this is inspired by my mom's very own chili mac recipe – I miss it so much and she never makes it anymore!!! 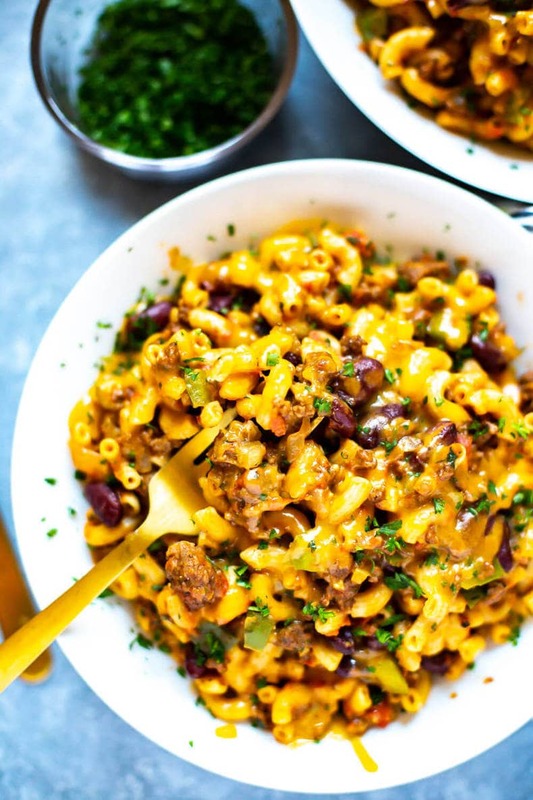 This Instant Pot Chili Mac and Cheese is super similar to this Homemade Hamburger Helper recipe actually, and you can totally use the method listed on the Hamburger Helper recipe if you want to try the one pot stovetop version of this chili mac. 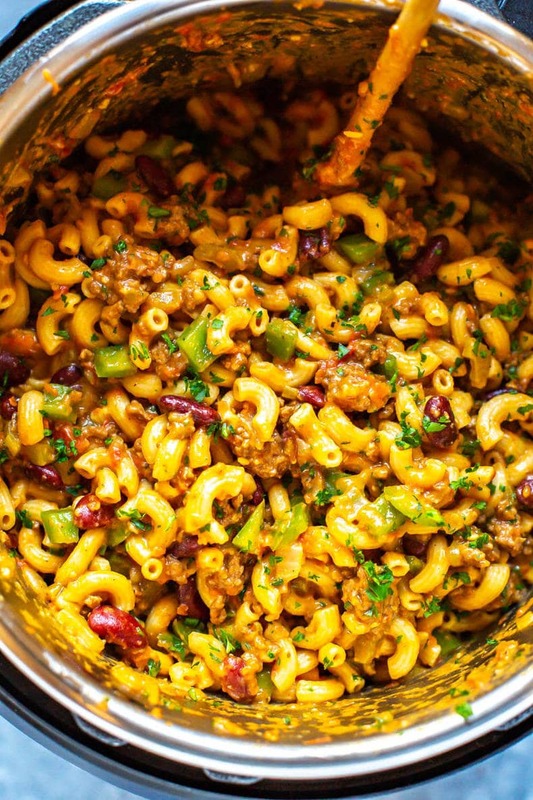 It should be a matter of sauteeing the ground beef first just as you'll do with the Instant Pot version, then you'll add in all the other ingredients, bring to a boil and cook over medium heat for 15-20 minutes until the pasta is cooked through. Stir in the green peppers and cheese last and you've still got dinner ready in a flash! Most of these ingredients are actually pantry staples so you shouldn't be running to the store for too many things. If you're like me and have a well-stocked fridge, you should already have celery on hand so from there it's just about making sure you have a well-stocked freezer with some ground beef. I've already listed the stovetop instructions above, so if you're looking to make it in the Instant Pot, all you basically need to do is saute the ground beef then dump the rest in the pot and cook on high pressure for 4 minutes. It really is that easy! 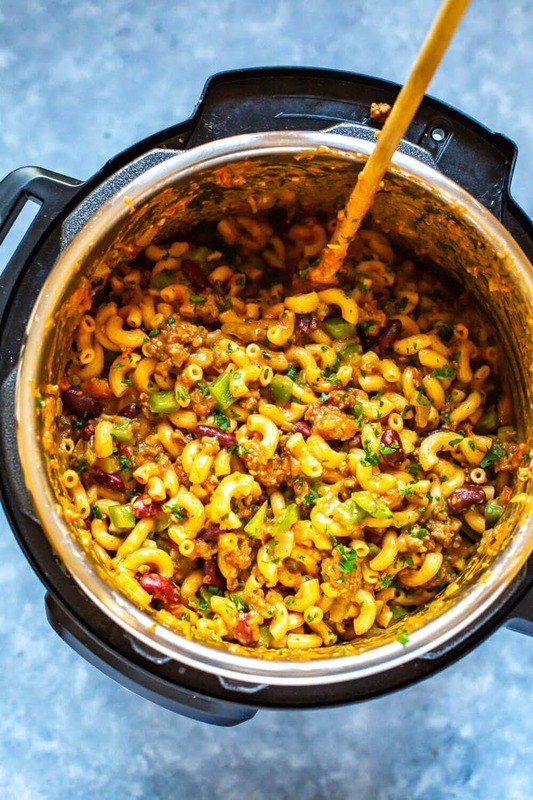 I find the Instant Pot method makes clean up a breeze so you're really just left with one big pot to wash.
You can get creative with the toppings and garnishes for this Instant Pot Chili Mac too! I usually add some chopped fresh parsley or cilantro on top, but some sliced avocado or jalapeno peppers would be awesome too! 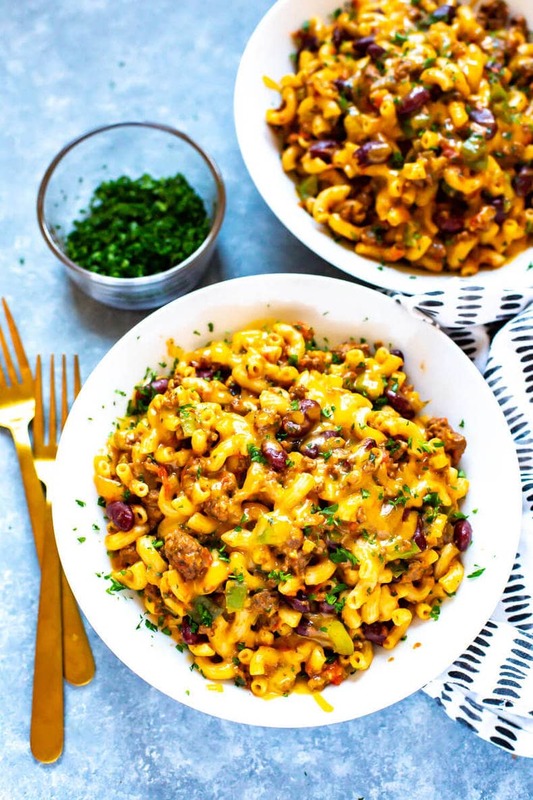 You could also just stir in some spinach towards the end too if you're looking to add in some extra veggies and make this chili mac more nutritious. 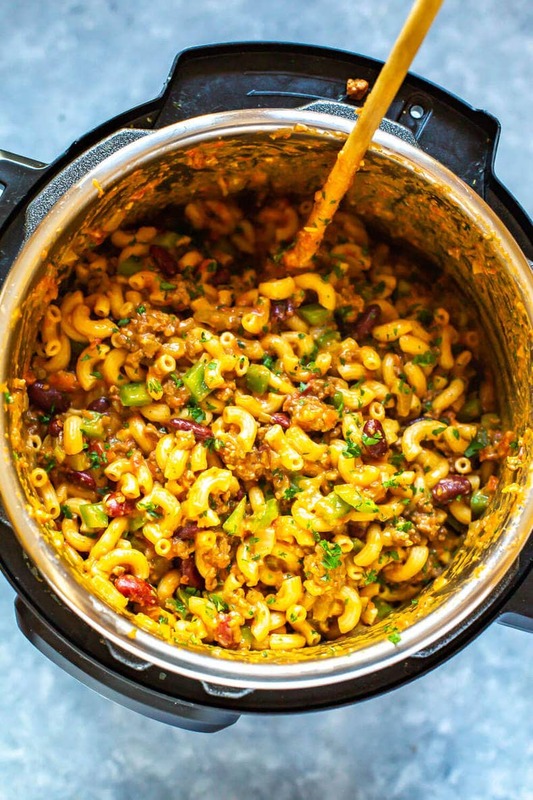 Will you be making this Instant Pot Chili Mac and Cheese? If you're looking for more delicious Instant Pot Pasta recipes, you should totally check out this Chicken Bruschetta Pasta recipe too! I love how you can make so many one pot pasta dishes in this thing! 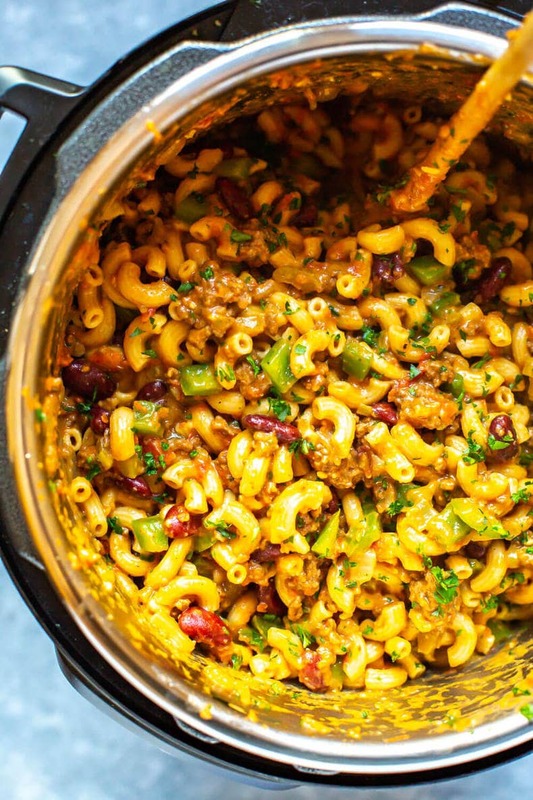 Grab some glass meal prep bowls if you plan on packing this Instant Pot Chili Mac in the freezer and defrosting in the microwave. Or these aluminum foil containers are perfect for re-heating straight from the freezer to oven. I love simple one pot meals like this. As a mom of 4 with a full time career sometimes getting dinner on the table is really an art! I’m defiantly going to try this. Curious have you tried using water vs. Broth? My first recipe I cooked in my new Instantpot! This has really changed how I. Meal prep. The ultimate comfort dish. This is on my favourite list. Yay!!! So happy to hear that Sarah 🙂 Thank you! 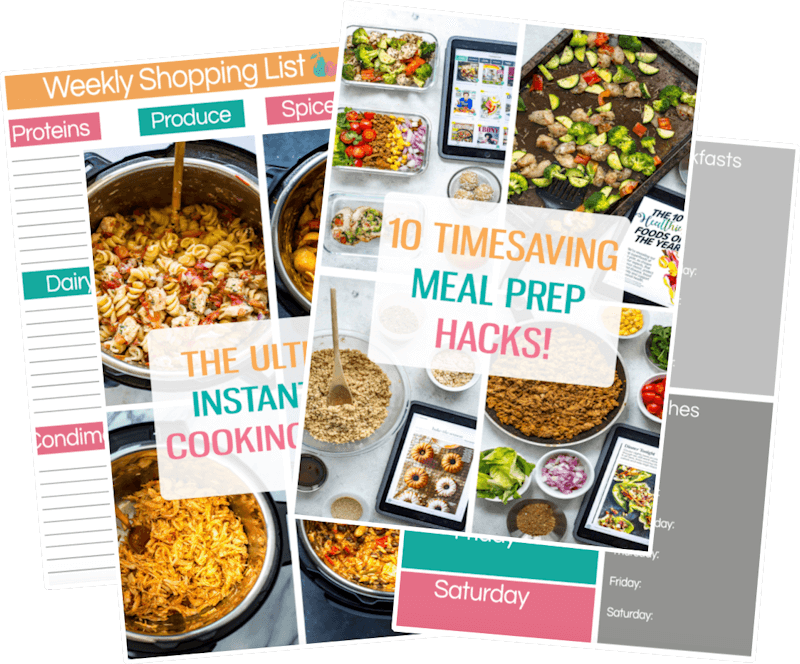 Holy-4-minutes-in-an-instant-pot!!!! As you can guess, I don’t have an instant pot (yet), but I’ve been going back and forth on the idea for months. But if it only needs 4 minutes when compared to the stovetop instructions (20minutes-ish)…then, wow. I might be sold! How much does this make and what is a serving size for your nutritional info? If I missed that I am sorry but noticed most of your recipes I viewed don’t have that info at the nutritional info. Hey Kat – it makes 8 servings (this is in the recipe card at the top!) so you would divide the recipe into 8 portions and then each portion is a serving. Due to time constraints I can’t give exact serving size measurements for my recipes, but if I had to guess a serving size for this particular recipe would be about 1.5 cups. Hope that helps! Thank you so much. I didn’t go to that area but I scrolled up and down for it. Thank you for the quick response. It is going in the pot for dinner now. What a great recipe! It took less than 20 minutes from start to finish, including prep. I left out the green peppers and cumin, and added a good dash of Tony Chachere’s Creole seasoning. Delicious! Thanks! Hi. Do you stir before pressure cooking? Hey Christine! I don’t stir anything after sauteeing the beef – stirring can cause burning on the bottom.